The Low Hollow trail at Weldon Peete Park is NOW OPEN (Do Not Use When MUDDY). 2.8 Mile Loop. 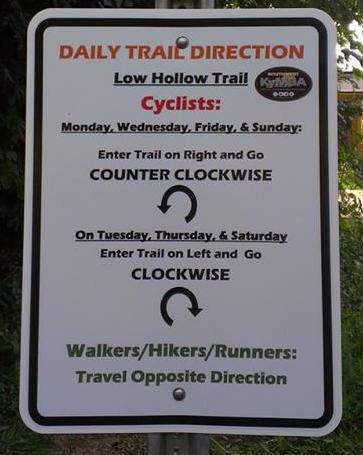 Due to popularity with the trail we have now incorporated Daily Directional Traffic. Monday-Wed-Fri-Sun is counterclockwise direction. Tues-Thur-Sat is clockwise direction. Southwest Kentucky Mountain Bike Association, the Bowling Green Riverfront Foundation and a host of Volunteers. Conceptual renderings by Lucas Slavey of VAN METER & Slavey. Weldon Peete Park, Bowling Green, Ky. You may enter the trail from the Greenways Path Trail head via the Riverwalk at Mitch McConnell Park or you can park at the main Lot at Weldon Peete Park . In January 2011 the Bowling Green Riverfront Foundation created the concept of the Barren River Outdoor Center (BROC). The BROC conceptual plan consists of a mountain bike trail, skills & pump track (Bike Park), bouldering area, and even a possible whitewater course. 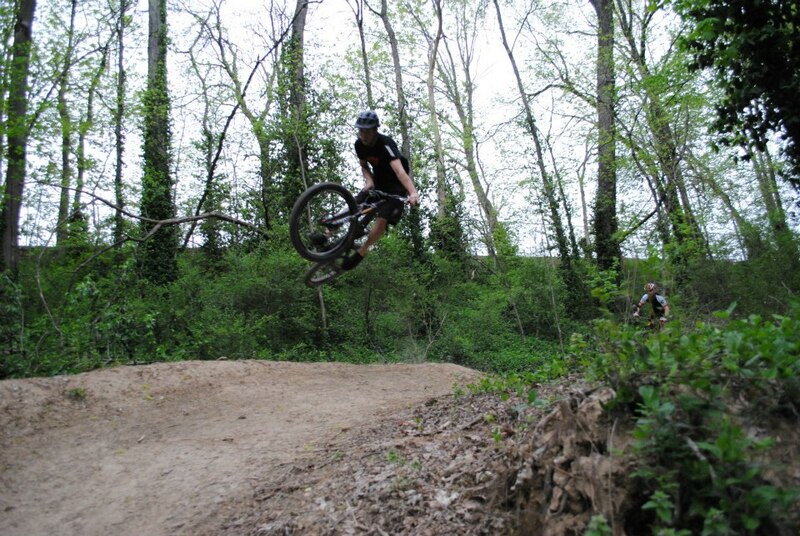 During the early phases of the BROC development the Bowling Green KyMBA Chapter (Now SW KyMBA) partnered with the BGRF to develop the Riverfront Bike Park (mountain bike trail, skills & pump track) phases of the BROC. Over a nine month period of time the idea of creating the City of Bowling Green’s first mountain bike trail (phase I of Riverfront Bike Park) slowly began to take shape. VAN METER & Slavey, LLC donated their expertise to create a conceptual map of the trail. Bowling Green’s Weldon Peete Park was in need to have its image changed as the Park had a growing reputaion for unlawful activities occuring in the Park. Moreover, the park had begun to be refuge of litter.. SW KyMBA’s vision of building a Multi-purpose Trail was twofold. It would bring local Mountain Biking, Hiking and Trail Running to a local Park as well as reshape its image and reputation. At 7:25PM on the evening of February 7th 2012 the Board of Commissioners of the City of Bowling Green under Municipal Order 2012-18 unanimously approved the agreement for the Bowling Green KYMBA Chapter for the rights to build the first single track trail in the City. Construction of the mountain bike trail began immediately. During the following few weeks KyMBA discussed several trail names. 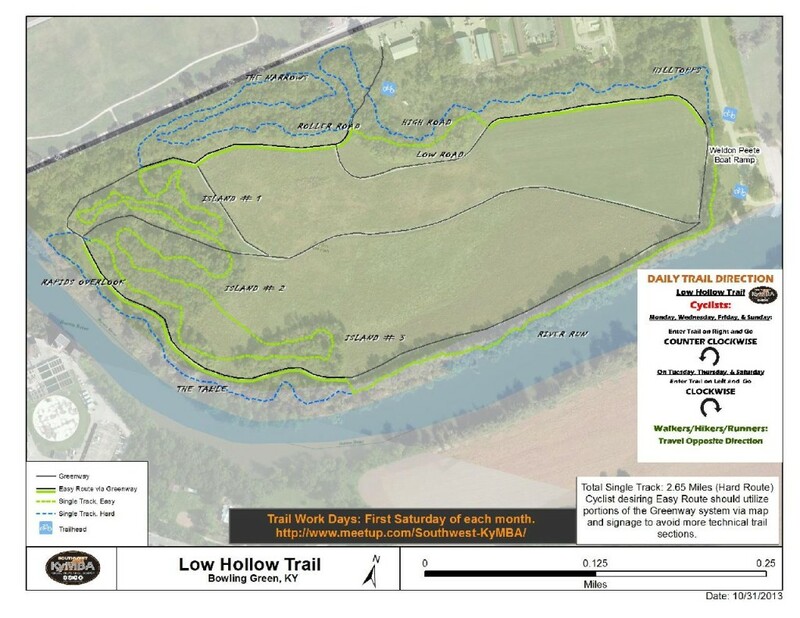 It was decided that the trail would be named the Low Hollow trail in honor of the recently closed Sal Hollow trail at Mammoth Cave and due to the low-lying topography of the area. 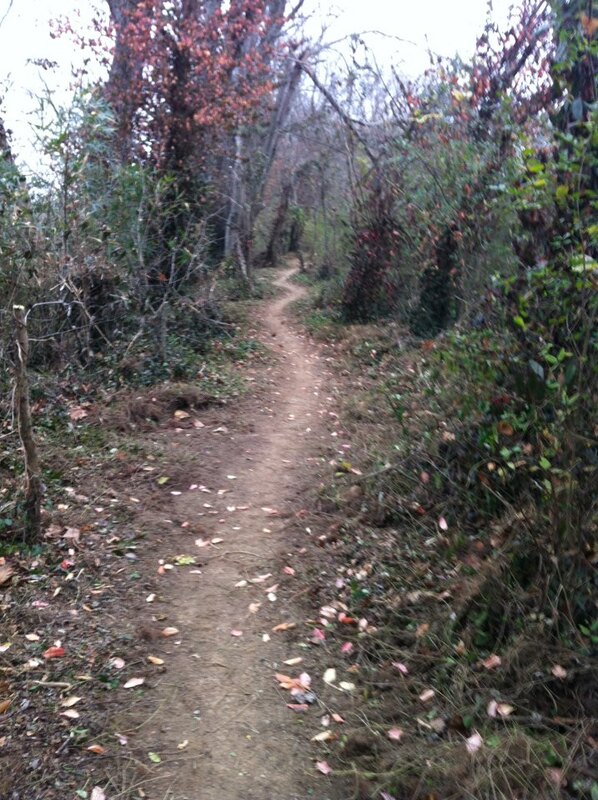 As of December 30, 2012 phase I of the Riverfront Bike Park aka the Low Hollow Trail was completed. To date SW KyMBA and its host of volunteers have put in 1,334 hours of their time working the trail. With help from sponsors the trail is continually being tweaked for better enjoyment. Recent additions include new beginner lines, a Roller section, a rapids overlook trail and a flurry of berms and tables. SW KyMBA still has trail work days on the first Sat of every month from 9 am till noon. The next step of the Riverfront Bike Park is Phase II which consists of the Skills and Pump Track to be located on the landfill embedded around the Greenway at the Riverwalk located at Mitch McConnell Park. http://warrenpc.org/greenways/pdf/RiverwalkPark.pdf SW KyMBA is currently underway working with the City of Bowling Green and Bowling Green Parks and Recreation to bring it to reality. The Skills & Pump Track will be approximately a 2000 yard’s of dirt project (100 truck loads). Definition: Pump tracks are manmade closed circuits with rollers in between and berms at each end. They are designed to be ridden without pedaling. A full-body workout, riders use their body to pump—or push down into the dip after an elevation and pull up before the crest of a mound—throughout the continuous loop. By absorbing and compressing your bike over rollers, you convert gravitational force and downward thrust into speed. All the Volunteers involved in the effort, Nats Outdoor Sports, Breck’s Bike Shop, Griffs Deli, Howards Bike Shop, VAN METER & Slavey LLC, Hensley & Company, the Bowling Green Riverfront Foundation, Bowling Green Parks & Recreation, the City of Bowling Green, KY and Trail Dynamics.